I rarely choose the meat option, unless there’s kibbeh! Torpedo shaped crispy dumplings filled with sweet onions and pine nuts, complete with a squeeze of fresh lemon juice are my absolute favourite street food and a must when visiting west London Syrian eatery Abu Zaad. There are various versions from all over the Middle East and Kurdistan, some made with meat, others with pumpkin, red lentils or potatoes, some known as kibbeh, others kubbeh, kubbah and kubbi! 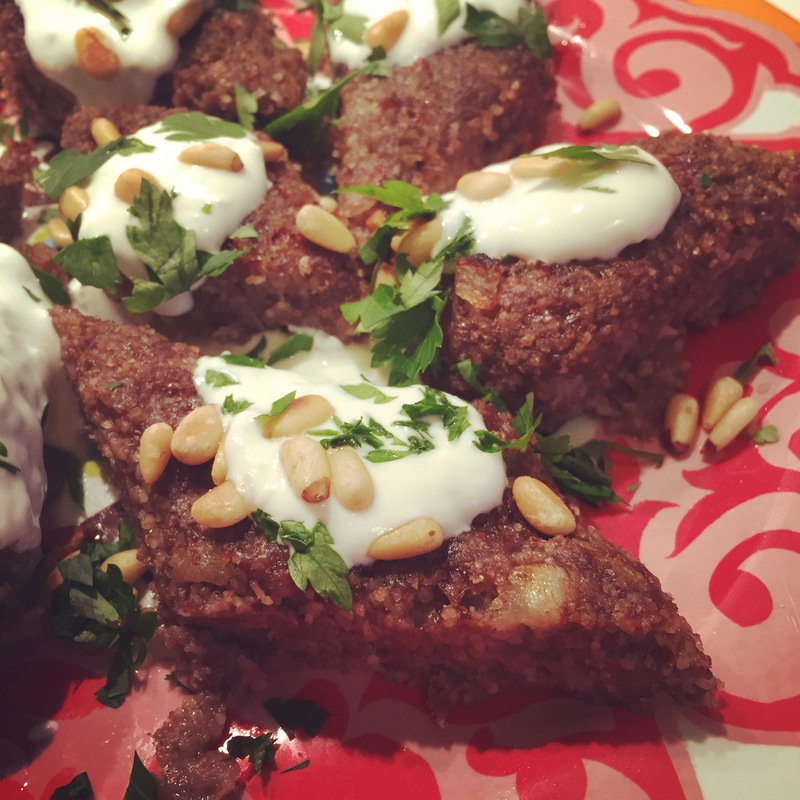 To make kibbeh requires time and patience (I currently have neither of these!) so here’s the next best thing; a simple baked version, easily prepared at home with the same inviting spiced meat appeal. Two thirds of a cup of fine ‘Ince’ bulgur wheat – rinsed well and drained. 1 onion – finely chopped and sauteed in a little olive oil. Mix the meat, bulgur, sauteed onions, spices and salt in a bowl. Knead well, making sure it is well combined then place into a greased baking tray, pressing down with knuckles. Cut into portions, (diamonds are most appealing, make the portions smaller if part of a mezze spread) then brush with melted butter and set aside for at least half an hour. Place into preheated oven at 180 degrees and bake until golden brown. For extra yumminess whack on the grill for the last few minutes to ensure a crispy topping. Serve warm topped with garlic yogurt, pine nuts, a smattering of parsley and lemon wedges. More savoury recipes? Click here! Or fancy something sweet? made it for lunch today , so easy and was so good! So glad you enjoyed it 🙂 Its a firm family favourite at ours.